A majority of people polled said they approved the president's plan to send 30,000 more troops to Afghanistan. Washington (CNN) -- Although the war in Afghanistan remains unpopular with most Americans, the public supports President Obama's decision to send more U.S. troops to the conflict, according to a new national poll. Fifty-nine percent of those questioned in a CNN/Opinion Research Corp. survey released Wednesday morning said they favor the president's plan to send 30,000 more U.S. troops to Afghanistan, with 39 percent opposed. "Most of those who oppose Obama's plan would like to see the U.S. immediately withdraw all its troops from Afghanistan," CNN Polling Director Keating Holland said. The survey indicates that a majority of the public opposes the war, with 55 percent of respondents opposed and 43 percent in support of the U.S. mission in Afghanistan. "Three in 10 say that they opposed the war from the start and another quarter report that they favored the war when it began in 2001 but oppose it now," Holland said. 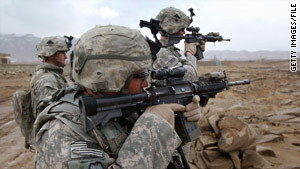 Only 18 percent of those polled said that the United States is winning in Afghanistan. Two-thirds said neither side is winning. "That may explain the support for Obama's plan, since a victory is likely to require more troops," Holland said. "But it may also explain the overall opposition to the war, since Americans tend to dislike losing." The survey also indicates a racial divide over Afghanistan, with whites questioned split over the war, but seven in 10 black respondents opposed to the war. In a CNN/Opinion Research Corp. poll conducted last month and released November 24, 45 percent of those polled supported the war in Afghanistan, and 52 percent were opposed. The most recent CNN/Opinion Research Corp. poll was conducted December 16-20, with 1,160 adult Americans, including 259 African-Americans and 786 whites, questioned by telephone. The survey's sampling error is plus or minus 3 percentage points for the overall sample.